So, it’s 2.40am, and most of you are asleep. Me? Trying to find out if Apple is going to be livestreaming this thing. This thing that we are assuming at this stage to be an announcement of two new iPhones, the rumoured iPhone 5S and the iPhone 5C. 3.08 am – For what it worth, the online Apple Stores is still offline. 3.09 am – OK, now we’re talking about iOS7. Apparently in a numerical kismet moment, next month will mark the 700 millionth iOS device. Seven is the number of the Apple beast(s). 3.15 am – So, there’s a bunch of new tricks in and around the Photo app on iOS7. OK. Nice. But let’s get to the things that some of us have dragged ourselves out of bed for! 3.17 am – iOS7 will work on iPhone 4 and up, iPad 2 and up, iPad mini, and iPod Touch (5th Generation) and up. iOS 7 will be a free download to iPhone 5 and 4S on September 18th. 3.21 am – New iPhoto, iMovie, iWork (Keynote, Pages, and Numbers) will be free apps. 3.24 am – “This year, we’re going to replace the iPhone 5. With not one, but two new designs.” First, as HEAVILY rumoured, the iPhone 5C, in green, white, blue, pink, and yellow cases, made from hard-coated polycarbonate material. 3.27 am – The iPhone 5C will have the A6 chip, 8 megapixel rear camera, new Face Time HD camera, higher capacity battery. Soft silicon cases that slip over the iPhone 5C, with cut-out holes to display the underlying iPhone’s colour, will sell for $US29. US pricing of the phone, bought with a 2-year carrier contract, will be $99 for 16GB, $199 for 32GB. 3.34 am – And the other new iPhone is the iPhone 5S. So these 2-product rumours have been spot-on. And there *will* be a gold iPhone 5S, as well as slate and silver. 3.36 am – Strike the “slate” – it’s Space Grey people. Space Grey. 3.37 am – “World’s first and only smartphone” with a 64-bit chip. That’s the A7 chip. 7 continues to be the number of this beast. 3.39 am – A7 chip is twice as fast as the A6 chip. Offers 46x the CPU speed, and 56x the graphics speed. Disappointing lack of 7 in those reported numbers. 3.43 am – There’s some sort of ring around the Home button of the iPhone 5S. More on this later I expect. 3.45 am – Oooh, a new piece of hardware inside, the M7 Motion Processor. Fitness and Quantified Self apps look to have been made front and centre. What with this sort of thing, and the new smartwatches, the Fitbits and Jawbone Ups of the world now have a very strong competitor. 3.48 am – Like the nips, the pixels are getting bigger. 1.5 microns to be precise. Mental as anything? No. But better photographs, what with the pixel size and the newly-designed camera with F2.2 aperture. 3.50 am – The iPhone 5S will have 2 x LED flashes, one white, one warm/amber, that work together to produce the best photo for the light. 3.53 am – A new ‘burst’ mode on the camera, shooting 10 frames per second. Also, the new camera will shoot Slow-Mo video at 120 frames per second, and ‘regular’ HD video at 720p at 120 frames per second. 4.00 am – in addition to unlocking the iPhone 5S, Touch ID will also be used as your password to buy from the iTunes store. Multiple fingerprints can be assigned to the one iPhone 5S. 4.04 am – US pricing is 16GB for $199, 32GB for $299, 64GB for $399 (on 2-year contract). The iPhone 5C an be pre-ordered from September 14. 4 .06 am– Australia – you can buy the iPhone 5C and iPhone 5S in stores on September 20. Same day as the US, Canada, China, France, Germany, Japan, Singapore and the UK. 4.10 am – that’s it for the iPhone. Now we’re talking about music. Brilliant. Elvis Costello on stage! He’s playing Nick Lowe’s “What’s so Funny About Peace, Love, and Understanding”. 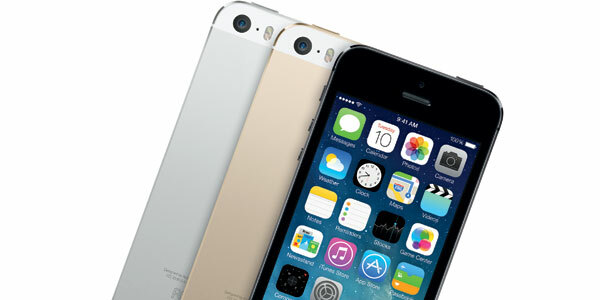 4.15 am – iPhone 5S – 16GB $869, 32GB $999, 64GB $1,129. 4.16 am – iPhone 5C – 16GB $739, 32GB $869. 4.17 am – iPhone 5c Case is $39. 4.21 am – Elvis plays one more song, “Tripwire”, from his album “Wise Up Ghost” featuring The Roots. So, there we have it. Two new iPhones, no iWatch, no Apple TV, no iBlender. Next ArticleNew iPhone 5S and iPhone 5C. No surprises?